Alex Howbert grew up in Detroit, went to Cass Tech High School, and spent his summers sailing, kayaking, canoeing, and swimming in the upper Detroit River and Lake St. Clair. He always wondered how he could get more people to enjoy water sports on the Detroit River and Lake St. Clair in the same way he did. His passion for recreating on the Detroit River led him to buy an old marina and start a business that would help make the canals surrounding Grayhaven Island and the Detroit River more accessible to people. “We have a beautiful resource right here, and it’s difficult for people to access unless they have a boat,” notes Howbert, founder of Detroit River Sports. For six years, he and his staff have been giving tours that paddle through the Grayhaven canals and by the old Fisher Mansion, around Belle Isle and Peche Isle, along the Detroit RiverWalk and past the Renaissance Center, and even as far down as historic Fort Wayne. Evening tours are capped off with watching the sunset over the Detroit skyline. Even though people have lived here their entire lives, most don’t even know the canals exist. Detroit River Sports even host a Paddle to the Table event where, after paddling the river, they partner with Coriander Kitchen and Farm to host a memorable outdoor dinner right on their marina dock. 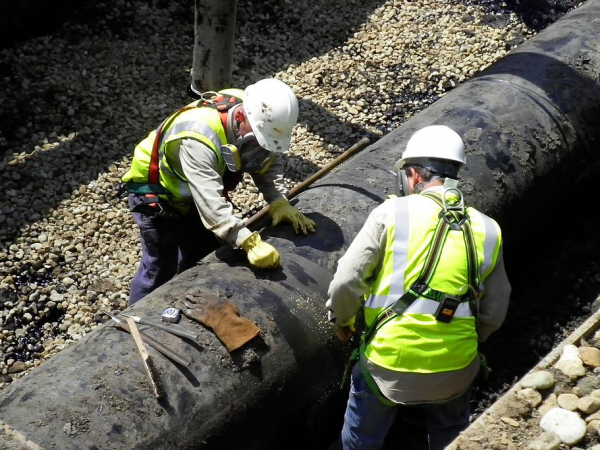 All of this is targeted at reconnecting people with the amazing Detroit River right in their backyard. 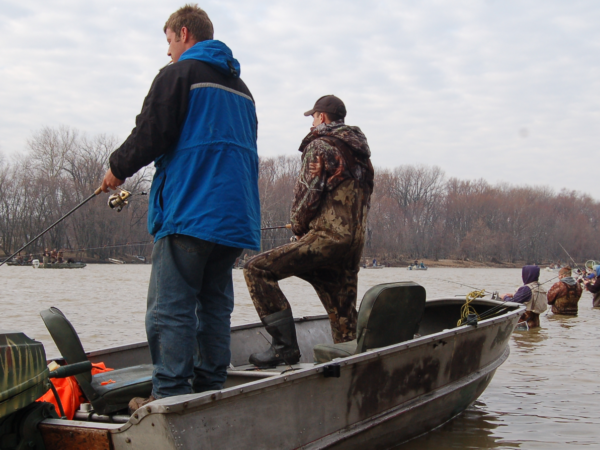 When people get out in the open water they easily forget they are in the middle of a huge metropolitan area. According to the Outdoor Foundation, 10.017 million Americans or 14.9% of our population participated in recreational kayaking in 2016. Those are big numbers. You can probably guess that interest in paddle-based recreation in southeast Michigan in growing, especially on the Detroit River. The unique paddling experience you can get on the Detroit River is truly remarkable. And research by the Outdoor Foundation has shown that this paddle-based recreation industry contributes $36.1 billion annually to the U.S. economy. 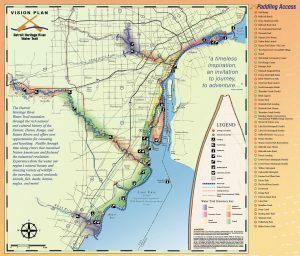 To address this growing interest in paddling, Metropolitan Affairs Coalition, a nonprofit organization made up of business, government, labor, and educational leaders dedicated to building consensus and seeking solutions to regional issues in metropolitan Detroit, developed a vision plan for a Detroit Heritage River Water Trail in 2006. Metropolitan Affairs Coalition brought together, under its Greater Detroit American Heritage River Initiative, numerous partners, including the Downriver Linked Greenways Initiative, Friends of the Detroit River, Huron-Clinton Metropolitan Authority, Michigan Sea Grant, National Park Service, the U.S. 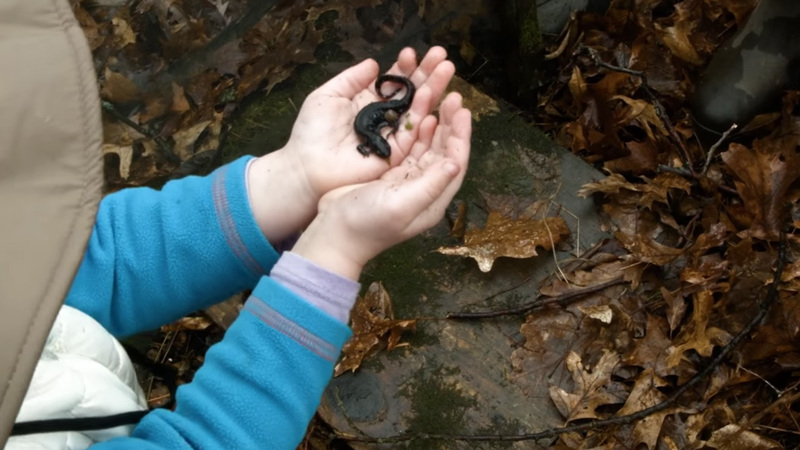 Fish and Wildlife Service, and Wayne County Parks. 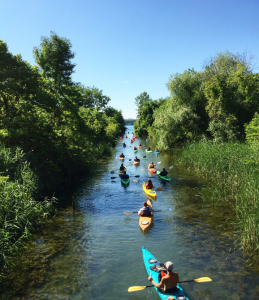 This water trail or blueway plan promoted existing, close-to-home, paddle-based recreational opportunities and called for future expansion of ecotourism. 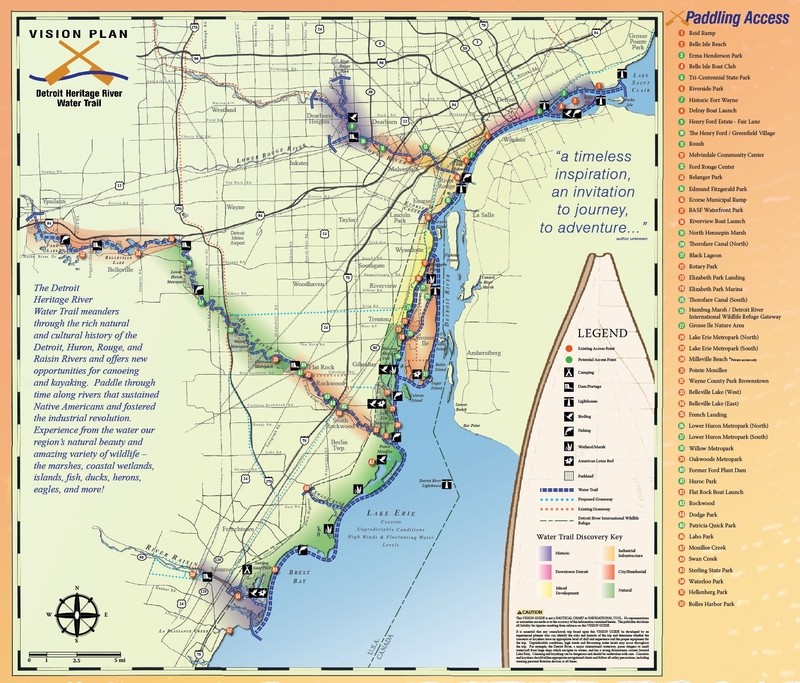 In 2013, the vision plan was updated to a usable water trail map that identifies both paddling access points and routes. Avid kayakers know that paddling allows you to see things and experience the great outdoors from a unique water perspective. Detroit’s Water Trail was created to provide kayakers and canoers with just such an exceptional paddling experience through waterways that sustained Native Americans, supported the Fur Trade, aided freedom seekers of The Underground Railroad, fostered the Industrial Revolution, and are now heralded as North America’s only international heritage river and international wildlife refuge. Paddling opportunities extend some 38 miles from the head of the Detroit River to Luna Pier on western Lake Erie in the southern end of Monroe County. 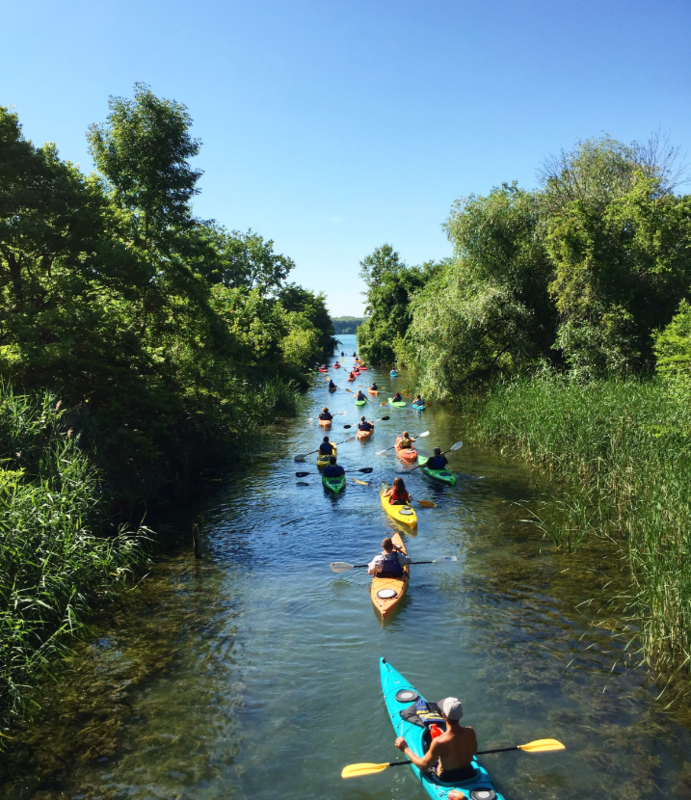 Along the way, paddlers can kayak through canals surrounding historic Grayhaven Island and through Grosse Ile. Paddlers can also see the 980-acre island park designed by Frederick Law Olmstead (Belle Isle), the oldest rowing club (Detroit Rowing Club) in the United States established in 1839, the international crossing of the Underground Railroad where forty thousand freedom seekers gained their freedom, the historical dry-dock area where 650 freighters were built during the ship-building era, the industries that made Detroit the “arsenal of democracy,” and truly exceptional wildlife, including waterfowl, egrets, bald eagles, herons, and countless fish being landed by anglers. Such paddling experiences are reconnecting people to both the rich history and biodiversity right in their backyard. Riverside Kayak Connection, a metropolitan Detroit kayak outfitter, also offers a variety of services and free events to promote paddle sports from Belle Isle and Milliken State Park’s Outdoor Adventure Center on the Detroit RiverWalk. On Belle Isle, Riverside Kayak Connection operates a kayak livery in the historic Flynn Pavilion that is located on the canals, offers classes, and hosts a demonstration day where people can try out different types of kayaks. Clearly, when most people think about kayaking and canoeing, they think about paddling through pristine rivers or lakes, or on streams running through wilderness areas or forests. 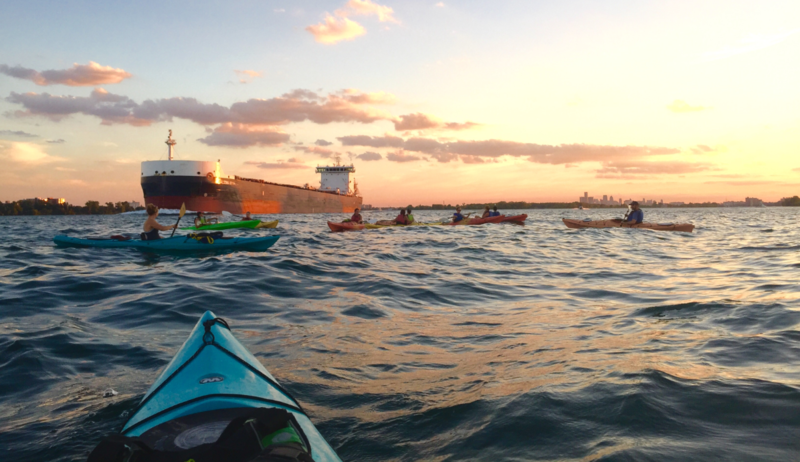 However, paddling enthusiasts along the Detroit River say you might be missing something very special right in your backyard. Michigan residents agree. In 2015, Michigan residents, through a Michigan Department of Natural Resources survey, identified the Detroit Heritage River Water Trail as one of the “Top 11” Water Trails in Michigan.